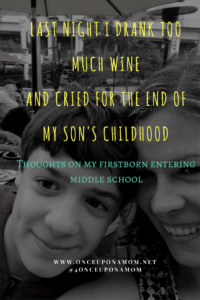 Last night I drank too much wine and cried for the end of my son’s childhood. Tomorrow morning I’ll receive an email with my 11 year old’s 6th grade schedule. Not his teacher. His schedule. All summer I’ve been listening to his voice crack and we’ve been giggling about it together. In the past year my son grew 5 ½ inches. If he keeps up at this rate, he’ll be taller than me when he is 12. In the spring my husband bought my son a an electric shaver because little kids on the bus were commenting on the beginnings of his mustache. He has bursts of anger – out of character for him. Today, he thought he lost something and he got mad. He punched the couch. He threw something across the room. All of a sudden he smells bad. Overnight, he’s gotten pimples. He’s getting stronger. I can ask him to help me up from the floor and he’s strong enough to actually help me. It’s not just the end of elementary school. It’s not just the beginning stages of puberty. It’s all of it. All of it happening at the same time. I remember so clearly the first day I put my son, my first born, my one and only baby to sleep in his crib for the first time. After 12 weeks sleeping in our room, my husband convinced me that he would survive the night in his own room, in his own crib. He looked so small in that big crib. I remember the first day he slept in his twin size bed. Tiny again. Then I blinked and now my son and I see nearly eye to eye. When he talks to me about Pokemon and Minecraft, I sit and listen in awe. Not at what he’s saying, but the sound of his new lower voice, that will deepen still. I watch his new taller, longer limbs poking out of pajamas that fit him two months ago. I look at his beautiful face, his longer, wider nose, his darker eyebrows, his dimple that I used to kiss every night, no longer just a pinpoint in a deliciously chubby cheek, now a longer line in a thinned out, grown up face. I try to remember the baby, the toddler, the child he was at the same time imagining the grown man he will become. It makes me cry for all the time that has passed. The realization that his childhood years are gone. And I can’t ever get them back. I know I should be grateful for all the time I still have with him, for this very moment, but right now, I just feel sad. Thanks Meredith! You are so sweet! Totally get it!!! And comiserating. 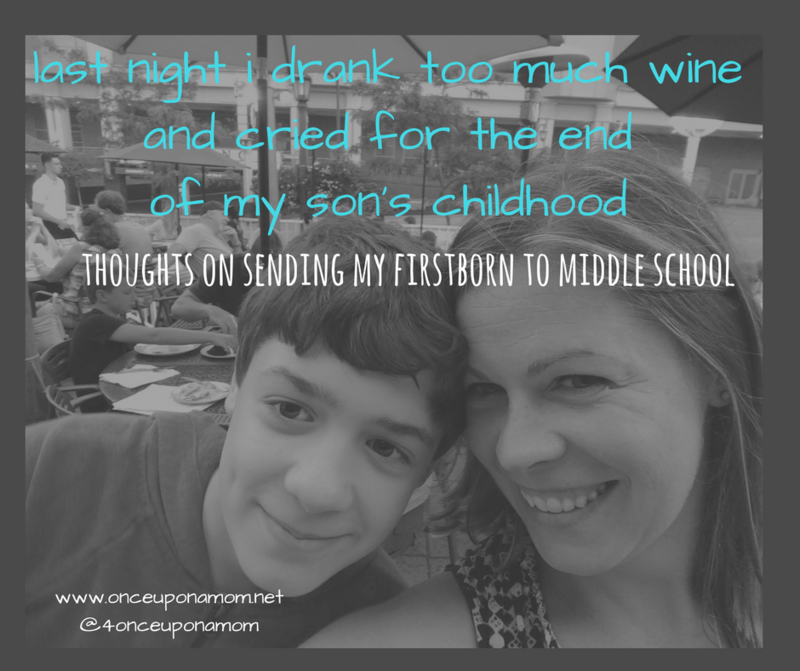 I lovingly refer to these crossroads as the #HappySad moments of motherhood. I just love that hashtag! It explains it all so perfectly!